A fight that has entangled almost every circus in the United States is in progress between the Ringling Bros., owners of a half a dozen of the big shows now on the road, and H. H. Tammen of Denver, the owner of the Sells-Floto show. According to Mr. Tammen, who spent several days here last week, the fight has just begun, although it has been in progress throughout the south and west all summer. So far the fight of the big syndicate and the smaller show proprietor has the appearance of a draw with advantage at present in favor of Mr. Tammen. "When we start to lose money, if we ever do," laconically remarked Mr. Tammen, "it will be with the knowledge that the Ringlings are losing several times as much as we do. When the question of standing a loss is considered, I guess we are able to stand as great a loss proportionately as are the Ringlings." "Paper," that forerunner of shows and circuses is at the bottom of the trouble which, according to Mr. Tammon, promises to result in a fight to the finish. "The fight is to be made a personal one," said Mr. Tammen, "inasmuch as we have positive information that the Ringlings have failed to pay license fees in many towns in Texas and we propose to see to it that all of their back license taxes are paid when they show in that state this fall. We will also see to it that their prices remain the same and are not put on a sliding scale. They have used this sliding scale where ever there has been opposition, making the prices cheaper and where there is no opposition, they have raised them." At present the war between the shows is with twenty-eight-sheet posters, which the Sells-Floto people are using, and quarter-sheet posters which the Ringlings are posting alongside the other big posters. The Sells-Floto circus shows the photographs of the five Sells brothers and Mr. Floto, while the Ringling show, known as the "Adam Forepaugh and Sells Bros." show, containing the pictures of two of the Sells brothers and Adam Forepaugh. Recently the Sells-Floto aggregation billed Virginia. After them came the quarter-sheet posters of the Ringling show, which told the public that they should not be deceived, and that the Adam Forepaugh and Sells Bros.' shows, united, will not visit Norfolk before next year. Down South the Barnum & Bailey show, which is one of the Ringling Bros.' attractions, began the real fight on the Sells-Floto show in April. On April 2 paper was put up in El Paso stating that the Barnum & Baily show was "coming soon." It is alleged that some of this paper was pasted over the Sells-Floto paper The Barnum & Bailey show did not appear in El Paso until the latter part of September. The statement that they are "coming soon" is declared by the Sells-Floto people as unprofessional. "We expect to bring court proceedings against the Ringling's as soon as we can get service on them," said Mr. Tammen. "It is possible that we will stir up something before the begining of the next year's season." "In ten year's time Kansas City will not have a peer in the world as a residence city," declared W. C. Dufour, city councilor of New Orleans, La., who with a party of delegates from that city passed through the Union depot last night on their way home from the Trans-Mississippi Commercial congress which was held at Denver. The party made the trip in A. J. Davidson's private car "Frisco No. 100." After the congress they visited the various points of interest in Colorado. "Here in Kansas City your park and boulevards boards have taken care of the future. They have planted these long rows of trees on your boulevards, so that in some ten year's time you will have drives which will rival any tropical city for shade. "Then, too, it is generally admitted that there is not a much finer boulevard system in the world than now exists in Kansas City. You have the hills and the flats, the straight lines and the curves and everywhere there is something that attracts and holds the eye." In the party besides Mr. Dufour were Beverly Myles, John Phillips, George Janvier, George Lhot and Judge I. O. Moore. All of the party were enthusiastic on the subject of the big river convention which will be attended in New Orleans by President Taft. "Kansas City was a mud hole when my wife and I left it for the West a quarter of a century ago," said F. S. MacJohnstone of Colorado Springs, Col., at the Hotel Moore last night. "Its transformation as we viewed it today from an automobile which whirled us over the magnificent boulevards is wonderful. Twenty-five years ago there were huge, ugly hills with rocks jutting out on every side, steep walks, poor sewerage, hilly paved streets and no park system. Now you have the opposite. In Colorado we have beautiful drives and parks for our natural mountain scenery gives us an unrivaled background. "Neither my wife nor I deemed it possible that Kansas City could make the strides it has since we left it. We have read of the growth of the city but did not realize its extent. We drove this afternoon through Roanoke. We used to go nutting in what is now one of the prettiest residence districts in the city. At that time it was occupied by a few shacks. "Although my father and I furnished locks and hardware for the Old Missouri Valley buidling which was located somewhere near Fifth and Delaware streets, the only familiar sight we met of any conssequence was the old Blossom house, opposite the Union depot. The hotel was built before we left Kansas City." Mr. MacJohnstone is a former alderman of Colorado Springs. With his wife he came to Kansas City to attend the wedding of a cousin, Fred MacJohnstone of Chicago, to Miss Lydia Dunning of Rochester, N. Y. Miss Duning was the guest of the MacJohnstones at Colorado Springs and came to Kansas City with them. The bride and groom departed yesterday for Chicago. Mr. and Mrs. MacJohnstone left last evening for Denver. WILL SEEK A NEW HOME. Believing that its present home is inadequate, the Helping Hand institute h as decided to move from the location at 408-10 Main street. This afternoon a committee will visit the new Nelson building at Missouri avenue and Main street with a view to finding accommodations there. The property now occupied by the institute is owned by it through the building numbered 410 Main street carries an indebtedness of $4,000. The conditions which make a change advisable were pointed out by Edward A. Brown of Denver, who slept at Kansas City's municipal lodging house one night not long since. His criticisms caused a thorough investigation, which resulted in a desire to change to a more advantageous building, and still remain within the financial resources of the institution. The committee which will visit the Nelson building is composed of G. W. Fuller, Dr. John Punton, C. D. Mill and E. T. Brigham. As a consequence of one night spent at the Helping Hand, not as a matter of necessity, but because the housing of the unemployed is his fad, Edwin A. Brown, a wealthy citizen of Denver, called upon Mayor Crittenden yesterday, to urge the necessity of establishing a municipal lodging house along the lines of those in New York, Chicago, Buffalo and one or two other large cities. Mr. Brown is a cousin of W. C. Brown, president of the New York Central railroad. He characterizes the Helping Hand as a monument of "what ought not to be." One night he gave a boy in Denver a quarter, and then set set after with the mendicant to see what he did with it. The boy did pretty well, but Mr. Brown thought that two things went wrong: the boy should not have been compelled to beg, and he ought to have been provided at public expense with a good bed and a breakfast to fit him for a day's work. That was the beginning. Then he set about seeing how other cities cared for their indigent. Mr. Brown went to Chicago. First he registered at the Auditorium Annex, got into overalls and jumper, put on a soft ulster, walked out of the hotel, checked the coat at a stand, and went to the Chicago municipal lodging house and applied for a free bed. He got it, and a god one. From there he went to New York, asked the police to give him a free bed, and got a better one than in Chicago. From there he went to Washington, where there is a national lodging house, once more in the jumper and the overalls, and the overalls, and foregathered in the dirtiest place he had been. He came to Kansas City, and says that here "is the monument for what ought not to be, the private lodging house that Kansas City offers as its haven for the 90 per cent of honest but unemployed men, and as many of the 10 per cent of rogues as want to get in. "New York paid $500,000 for a lodging house for the 1,000 men and fifty women it cares for nightly. Cleanliness marks every inch of space in it. I was shown the place by the police, checked in, ushered before a doctor, examined, given a night gown that I learned was one reserved for those physically and bodily well, and then repaired to bathe. I learned afterwards that my own clothing was taken to a fumigating room and there treated. "Others got different night gowns, and went to different wards, but before they were admitted to those wards they went to a dispensary and got medicines which they needed. "Next morning, refreshed by wholesome sleep in a clean place, and given a good breakfast, I set out with the other 999, ready to look for and do a day's work. "On coming to Kansas City I applied at the police headquarters for free lodging, and was told to go to the Helping Hand. There I went, and was told I would have to work for my bed and board.
" 'That I am most willing to do,' I replied, and then they took my hat as a ransom, and told me to go to a dormitory. It was dark, for somebody told me they had forty cots in the place. It smelled. "It was not directed to be washed, nor had any of the others who were huddled in there to spread or catch disease. I could not sleep, so noisome was the atmosphere. "I heard a boy moaning and went to see the poor chap. He was only 20, but was wracked with rheumatism and begging for relief. he had a few strips of cotton rags, which, from time to time, he took to a faucet to saturate, so he might bind his wrists. "An attendant came through. The boy called to ask if he could get into the dispensary in the city hall, saying his pain was almost unendurable. The attendant told him that 9 o'clock next morning would be the earliest hour at which he might expect any relief. "I was the first to get up, anxious to get out. In the dining room was a great throng. The meat was abominable. The coffee was not worth the name, and it was without sugar or milk. The bread was indifferent, the beans, barely palatable and the potatoes a disgrace. "After that shocking pretense at a breakfast I was told I must work two hours at the rate of 20 cents an hour, which was not teaching a poor man to be honest and fair with his fellows. I went with three others into the filthiest dormitory, not the ones I had slept in, to make up 116 beds. That number of men had slept in the place. "In New York no bed linen is used twice without being washed. I do not go far from truth when I say that the sheets in the Kansas City Helping Hand institute have not been washed for weeks, and the blankets not since they were first put on the beds. The blankets were stiff. In the dormitory I worked my two hours and got out of that place into a bath, where I kept an attendant going for the busiest hour he ever put in. I lost my overalls and jumper, as after that trip to the Helping Hand they are not fit for even another experiment." "We don't claim that conditions are ideal, but we do know that we have the best system in the country. We have not the money to erect magnificent lodging houses as they have in New York, but with the help of the city we have solved the problem of ridding Kansas City of the undesirable poor. "Men who want work are not out of employment for any length of time. Those who don't want work will leave the city when they find they have to go to work for all that they eat. The saloons and cheap lodging houses do not house men in any kind of quarters as formerly, thanks to the tenement commission. Every one is sent to the Helping Hand where they must work for the shelter and food they get. "In New York the municipal lodging house is the finest in the country, but they have no system to make a man go to the institution. If he detests work he can go to a bread line or a cheap saloon. He lives all winter without work and others are attracted to the city. "What's that," he exclaimed. "Governor Crittenden dead?" "Yes, he died early this morning," replied the man. "I am his cousin, and I have just arrived in the city for a visit with him and his family. This is the first I've heard of his death." Admiral Watson, who succeeded Dewey in command of the fleet at Manila, had been attending the convention of the Presbyterian general assembly in Denver. He was there as a delegate from Louisville, Ky., his him, and stopped off in Kansas City upon his return. He had been on the train for more than a day and consequently had missed the newspaper accounts of Mr. Crittenden's condition. At the Crittenden home, the governor's half brother, Logan C. Murray of Kentucky, is expected today. Governor Crittenden and his brother and cousin had planned a family reunion to be held June 18, at the Crittenden home in Shelby county. Paul Garvin, 25 years old and good looking, who lives at the northwest corner of Fourteenth and Oak streets, yesterday received word of an inheritance of $80,000 from a rich uncle in Denver, who has recently died, but to this fortune is attached the string of matrimony. Mr. Garvin, by the conditions of the will, must marry and settle down before the inheritance is handed over to him. No particular girl was named in the will, and now Mr. Garvin is "setting his cap." "Sure, I am going to marry," said he last night while discussing the condition imposed. "Not that I am going to marry for the money alone, but I am about to become 'one of our respected and influential citizens.' There's one drawback, however. I don't know any girl who would have me. I am perfectly 'heart whole and fancy free.' Until now I never had enough money on hand to think of getting married, and girls have not attracted me. But I am looking for 'her' now, and I am going to look fast, too." Mr. Garvin is wholly at sea in regard to his future wife. He has never had an ideal. "I don't want to advertise for a wife. I guess I will have to wait until the grand passion seizes me and then I will know all about it." Mr. Garvin's uncle was a resident of Denver, having large mining interests. His estate is said to be worth $1,000,000. His name also was Paul Garvin. The will made by Mr. Garvin gives all of his property to his son, with the exception of the bequest made to his namesake. Should Mr. Garvin die, unmarried, the money is to go towards the establishment of a free health resort in Colorado Springs. "Uncle Paul was peculiar," said Mr. Garvin. "Every time I saw him he would urge me to get married and quit roving. I am a chemist, when there is any desire to work on my part, and he wanted me to take charge of his assaying work for him. But I like to travel, and so I have been doing. I guess he was afraid to give me this money outright, thinking that I might blow it all in traveling. Mr. Garvin will remain in Kansas City indefinitely. Like a chapter from a novel is the story of the complications Mrs. Bessie A. Reynolds wove when she set a snare for a suspicious husband. The Reynolds live at 925 McAlpin avenue, Kansas City, Kas. The husband is a foreman at the Proctor & Gamble plant. Mrs. Reynolds is the mother of five children, the oldest of whom is 19. The dove of domestic peace has not been a continued guest in the Reynolds home for some time, due largely to the circumstance that the head of the family absented himself from home on Sundays, or of evenings and made no explanation to his wife as to where he had passed the time. "One day," says Mrs. Reynolds, "my husband accused me of liking some other man better than I did him and I said, 'That's so; there is another man.' I only wanted to make him jealous -- there is no other man, but he was so persistent that I finally decided to fix up a name and leave it where he would see it." Mrs. Reynolds wrote the name of Frank P. Courtney, La Junta, Col., in a small book in her handbag and her husband duly found it. Without saying anything to his wife of his discovery, Reynolds wrote to the postmaster at La Junta and asked him if Frank Courtney received his mail at that office. The answer came back that he did. Thereupon Reynolds wrote to Courtney asking him what he meant by meeting his wife. Courtney replied that he was not acquainted with Mrs. Reynolds; that he had not been in Kansas City for several years, and then had only passed through the town. Reynolds consulted with his wife's sister, who lives in St. Joseph. Without divulging her intentions, the sister wrote to Courtney, using Mrs. Reynold's name. The sister also doubted the existence of a man named Courtney, but when in due time she received a letter from him in which he stated that he was puzzled to know what all the fuss was bout, she no longer questioned his existence and immediately posted off to tell her sister, Mrs. Reynolds, what she had learned. It became Mrs. Reynolds's turn to take a hand in the letter writing. She wrote to Courtney, explaining the circumstances of her husband's letters and expressing surprise over the coincidence that she had given her husband a supposedly fictitious name and address which proved to be that of a real personality. Several letters passed between Courtney and Mrs. Reynolds before the tangle was straightened out to their satisfaction. "Dear Sir: I feel as though I owe you an explanation of how I have so innocently drawn you into my affairs. I hope when you have read this you will forgive me. In the first place, I never saw you, or heard tell of you, but will trust to your honor as a gentleman to keep the contents of this letter a secret. You will see it is a very personal letter. I am Mrs. Bessie Reynolds, mother of two grown children, and have decided to take a hand in this letter writing. My husband is insanely jealous of me and has indeed made my life almost miserable. "Two years ago I made the acquaintance of a man who proved to be a gentleman and who befriended me in a way I could not ignore and can never forget, and whom I grew to like very much. "Now, understand me, I do not say love. My husband forbade me to speak to him. I, perhaps, saw more of this man than I should. As I told you before, he is a gentleman, and is the case always, someone had to tattle. My husband demanded the name of the man whom I cared more for than him. "Thinking if he thought I did care for someone else, and hoping he would be kinder to me, I told him yes, there was someone. At last, in desperation, I, not knowing that you or any other man of that name existed, and to turn his mind from my friend, I simply made out in my mind the name of Frank P. Courtney. Then, of course, he demanded to know where he lived, and, as I wanted to put this imaginary man out of his reach as far as possible, and having told him that Mr. Courtney was a railroad man, knowing La Junta was a terminal, I told him that town. And I thought everything was O. K. until he marched in with the letter from this La Junta postmaster, saying that you did exist and received your mail there. "Well, I will just leave it to your imagination as to my feelings when I found out you did exist. I just almost collapsed right there. In the meantime my sister in St. Joseph, knowing why I had told so many stories, or lies, if you choose to call them by their right name, wrote you in my name to prove to my husband that you did not exist. "She almost died when she found out you were a sure-enough, very much alive man. "I told my husband when that old idiot of a postmaster wrote him you were there that I had storied at first. I could not make him believe, and pleaded with him not to write to you for I was afraid that you might be married and it would bring trouble to you and your wife. I was also very much ashamed to have you know anything of this affair. I never can tell you how sorry I am to have caused you the annoyance I evidently have. "I will ask this favor of you, if not too much trouble to you: Will you write me what my husband wrote you? Now, I don't want him to know I have written you, so I will post the postman as regards La Junta letters, and I will appreciate an early reply to this, as I wish very much to know where I stand in your estimation. It hardly seems possible that you are a sure-enough man and do exist when I just made you up out of my mind. "Hoping if we ever meet it will be as friends. I remain confidentially yours, MRS. BESSIE A. REYNOLDS." "I was never more surprised in my life than when I discovered that a man named Courtney really existed," said Mrs. Reynolds last night. "I am sorry I wrote the letter, but I was angry when I found my husband had written out there to see if the name he found in my pocketbook was that of the man whom I had foolishly told him I cared more for than I did for him. It has taught me a lesson about writing letters that I will never forget." Mrs. Reynolds is a handsome woman of the Spanish blonde type. She is a member of a Kansas City, Kas., Baptist church and has lived here for fourteen years. J. B. Markey, whose children live at 1303 West Thirty-ninth street, but who spends most of the time on his big farm in Harrison county, treats as a joke the "Black Hand" letter sent him from Denver, demanding $10,000 under pain of death. It was last Friday when Mr. Markey received the letter, postmarked at Denver. At that time he was on his farm near Gilman City, Mo., and the missive had been forwarded to him from Kansas City. Laughingly he handed the letter to his friends and then forgot about it. Being advised, however, to send the letter to Denver authorities, Mr. Markey did so, and since yesterday morning nothing more had been heard of it. Then it developed that the lives of his children were being weighed against the $10,000. The letter was poorly written and demanded that the $10,000 be apportioned in designated bills, to be delivered at a certain address on Wellton avenue, in Denver, within thirty days of the date of the letter. No mention was made of the three children. Certain reports, however, have frightened the children, who are ignorant of the exact demands made upon their father. Yesterday morning W. F. Farren, 3136 Central avenue, a nephew of Mr. Markey, read the letter in a morning paper, and hastened to the Markey home to break the news to the family. Some friends had preceded him and had talked with Miss Markey over the telephone. Though he assured the children that no harm whatever attended them, their fears were not fully dispelled. Last night Miss Markey refused to discuss the matter. "It is doubtless the work of some crank who knows that Mr. Markey has some money, and thinks that he can be bluffed into giving it up. Mr. Markey has not the slightest fear of harm resulting form the affair, and treats it only as a joke. "Mr. Markey has no intention of complying with the demand. He pays less attention to the affair than do his friends." The New Elms hotel of Excelsior Springs, owned by the Elms Realty Company of this city, and costing more than $250,000, has been leased, and will be ready to open, it is said, by the lessees, in six weeks or two months. The building is practically completed, except part of the interior woodwork and furnishings. The lessees of the building, Samuel F. Dutton and A. M. Epstein, are from Denver, and own the Albany hotel there. They announced yesterday that they will spend $75,000 in furnishing the new hostelry. It will be under the management of F. W. Taget of Denver. AND HIS WOMAN COMPANION WERE CAUGHT. The operations of a gang of counterfeiters in Kansas City came to a sudden end yesterday with the arrest at Seventh and Penn streets by a United States secret service agent and city detectives of a man and woman giving their names as Charles King and Mary Cook., and the discovery of the apparatus used in making the spurious coin. Both admitted that bad dollars had been made for the past month. For the past few weeks Charles A. Adams, United States secret service man in Kansas City, has received complaints of bad coins being circulated. He paid particular attention to the arrest of Daniel Kelly in Kansas City, Kas., March 19 for passing a bad dollar on William G. Smith, a grocer at 1700 North Third street. At the time of his arrest Kelly had three irregular coins in his possession. In police court Judge Sims fined Kelly $500 for vagrancy. Adams, who visited Kelly in prison, says Kelly confessed making the coins and said his assistants were living at 621 Penn street in Kansas City, Mo. 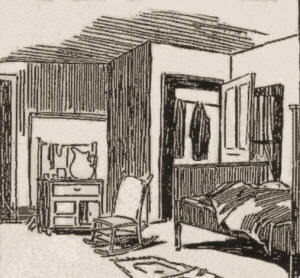 Adams gave the facts to the police department and Andy O'Hare and Samuel Lowe, detectives, found that the couple were living in the basement of the brick house at the number which Kelly gave. Though the detectives watched the place last Sunday, nothing worth mentioning was discovered. The coins which the couple passed were good ones and could not excite suspicion. Adams himself watched the house yesterday morning. About 10 o'clock the woman came out and got on a Roanoke car and at Southwest boulevard changed to the Rosedale line. The secret service man, of course, was following her. In Rosedale the woman alighted and entered a grocery store and asked if the clerk could change a dollar. The clerk looked at the coin critically and returned it. "It's no good," he said, and the woman hurried out. She walked a short distance when she met a little girl. "Have you the change for $1?" she asked. The child shook her head, and she passed on. When Mrs. Cook came to the baker of Mrs. Florence Catley, 1142 Kansas City avenue, she entered and again attempted to pass one of the dollars and was again refused. Out on the sidewalk, Adams stopped the woman. "You are under arrest," he said. "Why, I didn't know that it was a bad coin," she protested. "It certainly looks like one, doesn't it?" But she accompanied Adams up town and as they were walking up the front walk to the rooming house, Detectives O'Hare and Lwe came out with King. She broke down and in the presence of King told the whole story. "It was all Kelly's fault," she sobbed. "We came here from Denver four weeks ago and there wasn't a job in sight that my husband could get. At last he fell in with Kelly, and then they began to make the bad dollars. But today is the first time that I tried to pass one of the coins. Last night we ate the last food in the house, and I had to do something. I went out and tried to pass one of the coins to keep from starving." The man hung his head during the recital, and at her conclusion corroborated her statements. He said that they had heard of the arrest of Kelly in Kansas City, Kas., and destroyed the molds at once. In an old vault at 512 Broadway where several buildings have been torn down, he told the officers that they might find the broken pieces. Following his instructions, the officers found five sets of plaster moulds, a quantity of tin and antimony, and a moulding pot. All the material was taken to the federal building and will be held as evidence. The prisoners were taken to police headquarters, where the woman was placed in the matron's room and the man in the holdover. In the matron's room the Cook woman said that she had formerly lived in Kansas City. She said that she had purchased a home on the installment plan at 2044 Denver avenue, and had made six payments, until last December. She separated from her husband, Thomas Cook, about a year ago, she said, and went to Denver. There she met King, who was working for a gas company. "We came back to Kansas City because times were hard," she said, as she wept, "but he couldn't get any work here, and he fell in with Kelly. I didn't know for some time that they were making the bad money. Today is the first time that I tried to pass one of the coins." The couple will be turned over to the United States authorities today. None of the neighbors suspected anything wrong. The family of John Pulliam, who lived on the same floor in the basement, thought that the man and his wife were employed down town. Kelly and king, the woman said, generally made the coins at night. They were such poor imitations that it is doubtful if many were passed. Bond on a Charge of Bigamy. John W. Roberts, a promoter, with offices in the Jenkins building, Thirteenth street and Grand avenue, was arraigned before Justice Richardson yesterday, charged with bigamy. The complaint was filed by Mrs. Maggie Roberts, 2305 Minnie avenue, who claims that Roberts, after deserting her nearly four years ago, married Teressa Helmer in Denver, Col., in June, 1906. Roberts was released on $2,000 bond for preliminary examination April 2. "I was married twenty-two years ago, and lived with my wife until about four years ago," said Roberts yesterday. "We simply could not get along together, and I left her. Since that time I have sent an average of $75 a month to her. She came into my office last Monday, and demanded that I give her $100. This I refused to do, and told her that I would allow her $40, which she took. "We had two children, Lillian, aged 19, and William T. aged 17. My daughter is living with her mother, and the boy just arrived in Kansas City today from Texas, where he has been working. He probably will make his home with me at 1122 Tracy avenue, if he remains in this city." William T. Roberts met his father in the Jenkins building last night. He said that with a few exceptions Roberts had provided regulary for his first family. The second Mrs. Roberts is living at 1122 Tracy avenue and is the mother of a 7-months-old baby girl. "I have no plans. When the proper time comes I will make my statement. These charges have been brought against me and they will have to be proved. There is nothing farther to say." He Relieved His Aching Feet. Stopping over in Kansas city while on his way to Denver to visit his parents, Patrick McGuire, a soldier, attended the Shubert theater last night. He purchased a ticket which gave him a seat well down in front of the parquet. Shortly after the curtain rose, his feet commenced paining him and he immediately removed his shoes. Complaint was made at once by patrons of the theater sitting nearest to Patrick. An usher asked him to put his shoes back on. He refused. Officer James Lillis was called, and after a lively struggle, Lillis and three ushers finally ejected the irate soldier boy from the theater. He was immediately placed under arrest, the charge against him being disturbing the peace. McGuire has served as a soldier in the regular army for fifteen years. Ten days ago his time expired. DENVER IS FIFTY YEARS OLD. DENVER, Nov. 17. -- The fiftieth anniversary of the founding of the city of Denver was quietly celebrated today. And artillery salute was fired on the capitol grounds and tonight a banquet will be held at which reminiscences will be exchanged by eight former mayors, seven pioneers of '58 and several hundred other early comers. W. H. H. Larimer of Kansas City, who helped stake out the first claim taken here and was the first treasurer of that city, will be a special guest of honor. He is the only surviving member of the first administration. After much delay and no little impatience on the part of the many curious spectators who crowded the court room at Buckner, Mo., yesterday morning, W. A. Johnson, on trial on a charge of attempted wife murder, waived his preliminary hearing. He was bound over to the criminal court in $4,000 bond. Justice James Adams, before whom the case was called, at first placed the bond at $5,000. "Your honor, don't you think that is a little stiff," asked T. A. J. Mastin, who represented the defendant. Our client can hardly raise $1,000." After some argument, the matter being satisfactory to the state, the bond was lowered to $4,000. Then time was asked that the defendant might secure bondsmen. The judge granted one hour. FRIENDS GONE -- ATTORNEYS HELP. For several days previous to the trial Johnson had circulated among those who had been his friends in Buckner and Independence, trying to secure someone who would sign his bond. But when Tuesday came and he had no success he went among those in Buckner with whom he had never had business transactions, but to no avail. Sentiment in his home town is strongly against the man, and no one would give him help. It was soon decided that no bondsmen could be secured and his attorneys, Mr. Masten and W. S. Fournoy, expressed their willingness to sign the bond. Immediately Johnson was released on bond he was rearrested on the charge of forgery, his wife declaring that he forged her name on a deed in January, 1908. As the warrant for his arrest on that charge had been sworn out in Independence, he was taken there by the marshal and the justice of the peace sought. The party arrived at the court room late in the afternoon and the judge was not present; consequently the state expressed its willingness to let Johnson have his freedom under guard until the bond could be fixed this morning. Johnson's attorneys have signified their intention of signing the bond. Johnson has aged remarkably within the past month. His extreme nervous manner has increased, and while the complaint which charged him with having struck his sleeping wife with the desire to kill her was being read by the judge, the defendant nervously fingered his hat and his hands trembled violently. Mrs. Johnson, the victim of the assault, has been improving rapidly and is no longer confined to her bed. Yesterday afternoon in the presence of Prosecuting Attorney I. B. Kimbrell; his assistant Will Carmody, and her attorney, J. G. Paxton, she reviewed the whole case. Once, in telling of her endeavors to win Johnson from the kind of life which he had been leading, the woman, now wrinkled and still suffering from her severe wound, broke down and sobbed. "Oh, why did he do it? He knew that he was breaking my heart." It was some minutes before she regained control of herself. The story of the life which she had been forced to endure within the past two years moved her vastly, and she could scarcely talk at times. "When I first learned that he was associating with a Mrs. Howard of Kansas City, I went to him and begged him to leave her and come back to me," she said. "But he would not do it, and he tried to deceive me. It was always business that called him to the city every morning, and it was business that kept him there almost all of every week. "In February of last year he insisted that I go to our ranch in Mexico. I did not want to go, but he was so urgent that I finally gave in to him, as I always did. He gave me $8 to spend on that month's trip, and I did not hear from him but once. I did not know then that he had been in Colorado with this other woman, but the night that I got home I heard that he had returned the day before. "Something made me go through his pockets that night, and I found a receipted bill from the Savoy hotel in Denver made out to W. A. Johnson and Mrs. Howard of Kansas City. The bill was a very large one. I have it now. "The next day I asked him how long he had been in Denver and hinted that I knew all about it. He did not say anything at all. But from time to time he would go away on long business trips and take this woman with him. In Mexico, where he usually went, I had friends, and they recognized him and Mrs. Howard. They told me about it, but I could not say anything to Dode (her husband's nickname) about it. Finally things got so bad that I told him I was going to leave him after threshing this fall and that we would divide up the property equally and he would go his way and I would go mine. Nothing was said by him to that proposition. "When the wheat crop was in he got about $1,800 for it. I asked him for $25 to buy a new dress, and though he always promised it, he gave me less than half of the $25. Most of that I spent for things for him. "But before then he had signed my name to a deed which transferred $1,000 worth of property. I never saw one cent of that money. He promised that he would make it all right, but he never did. I never threatened him with exposure, but he knew that I knew of the forgery. It made him afraid. "Less that a month before that night (she referred so to the night of the assault) Dode came to me and told me he was going back to Mexico to settle up the ranch business. I told him that he would have to take me. He did not want to do so, but I said that I would follow him on the next train if he went without me. He wouldn't be able to lose me like he did his little niece whom I sent to Mexico to take care of him last fall. But he did not go and nothing more was said about the trip up to that night." Such, in part, is the story which Mrs. Johnson told her attorneys. She told about other women in Kansas City with whom Johnson had lived, one in particular. She said thatJohnson bought an expensive house for this woman on Bales avenue and furnished it luxuriously, with chairs which cost $150 apiece. But Johnson did not pay the bills he contracted in Buckner, she said. She always opened his mail and knew, for he could not read. The prosecutor and those associated with him have no doubt that they can convict Johnson on both charges. They say that the forgery is a clear cut case and there is no way out of that. Though the assault case is purely circumstantial, Mr. Kimbrell believes that Johnson's own statement will convict him. The state is very anxious to get the assault case to trial within the next two weeks and will make every effort to do so. Meanwhile, in Buckner, W. A. Johnson, once the most respected man in the community, walks the streets and is shunned by those who once called him their friend. He said yesterday that he intended spending the greater part of his time on his farm near the town. "Mississippi is not only one of the 'solid South,' but it has a greater distinction," said Ex-Governor A. H. Longino at the Coates house last night. "Mississippi not only gave Judge Parker its electoral vote in 1904, but every precinct in the state was carried for the Democratic candidate for president." The ex-governor was on the way from the Democratic convention in Denver to his home in Jackson, Miss., last night. He stopped off here yesterday to visit some friends and to get a more extensive view of the city than he has ever had before. He comes here frequently to trade at the Kansas City mule market and was a delegate to the convention here in 1900. He was also a delegate to the convention at Denver last week. Friends of former Mayor James A. Reed were told yesterday unofficially that Mr. Reed had been decided upon to place William J. Bryan in nomination for the presidency. The distinction , which would in a measure reflect upon Kansas City and Missouri, was enough to make the most ardent friends of the former mayor on good terms with themselves, but there were some of the most enthusiastic who looked so far as to see a deadlock and Reed's name put at the head of the ticket. "That is how General Garfield got to be president," said one man, who was discussing the tip. "Garfield went to Chicago to place the name of John Sherman before the delegates. He did so in such a tremendous speech that when it came to balloting the convention showed it had been carried away by Garfield's presence and speech, for it nominated him. Reed can make a speech on Bryan and Democracy that can stampede that convention, if it is true that seventeen states are in caucus this afternoon trying to find somebody to stampede them. Mr. Reed is one of the "big four" from Missouri. Governor Folk, another of the squad, is in Denver, but is not getting a word in edgeways, according to the news dispatches. But Folk is to be heard from. He has a speech of his own and it is a trick of his to have a claque organized to call for him at the psychological moment. His speech is a most temperate one. Folk is running in Missouri for the senate. To make a pro-Folk anti-Bryan speech in Denver would mean to invite certain assassination in the senatorial election in November. Folk wants to be president or senator, and his speech is cut to fit either job. It will disappoint the ultra Folkites at home. LANDS IN MRS. EDSON'S LAP. Driven by Kansas City Woman. DENVER, COL., June 26. -- (Special.) While on his bicycle at Sixteenth and Larimer streets, and trying to dodge a car yesterday afternoon, Joseph Skega, an employe of the Denver Fire Clay Comapny, had a head-on collision with the automobile of Dr. W. L. Hess, breaking the glass of the wind shield and driving completely through it into the lap of Mrs. J. E. Edson, wife of the president of the Kansas City Southern railroad, who was driving an d was sitting in the seat beside the physician. Mr. Edson and his family had just reached the city in a private car. They are friends of Dr. Hess, who received them in his automobile at the union station. In the machine, besides Mr. and Mrs. Edson, were his daughters, Mrs. K. P. Williams, wife of the quartermaster at Fort Leavenworth, Kas, an d Miss Geraldine Edson. The front wheel of Skega's bicycle struck the hood of the automobile, throwing the rider over the handlebars and against the glass of the wind shield. Jagged edges of the glass cut the victim's face and neck in a dozen places, while his bicycle was wrecked. Mrs. Edson's dress was bespattered with blood from his wounds. Dr. Hess placed Skega in the automobile, and after reaching the city hall assisted Police Surgeon Ackley in dressing his wounds, later conveying the injured man to his home. Kansas City Man Named as Assistant Sergeant-at-Arms. Kansas City Democrats have passed the special train stage for their Denver convention. Steve Sedweek, who is organizing the party, saying that up to yesterday noon 146 had signed contracts for transportation. One hundred form a train load. George Kingsley, an attorney, yesterday received notice from Thomas Taggart, chairman of the national Democratic committee, that he had been appointed an assistant sergeant-at-arms at the convention to be held in Denver next month. ER, TELLS HOW HE DID IT. George Elliot, who gave the name of George Bullene when the police arrested him and found a counterfeiting outfit in his rooms at 511 Locust street Saturday night and the woman with him, Tillie Bullene, from whom Elliot chivalrously borrowed a name, yesterday told Police Captain Walter Whitsett exactly how they make bad money. Block tin, purchased from any tinner, and antimony are melted together and cast into plaster of paris moulds by the Elliot process. The imitation coins are then plated with nitrate of silver by the very ordinary process of electrolysis, known to every school boy. A file is used to trim off the rough edges and make the milling uniform. Sixty-six of the alloy dollars were taken from Elliot's room. They have the ring of a real silver dollar, are very little under weight and look like good money. One has to take the Elliot brand of coin between the fingers and feel its smoothness before one would detect that it is not the genuine article. Elliot used three real dollars to make his plaster of paris molds. They are of the years 1899, 1900 and 1901. The original coins, molds, alloy, metal, electric batteries and all were found by the police. Eliot, in his confession says he learned how to make this money from an old counterfeiter in Denver seventeen years ago, but never made use of his secret until two months ago, when he was t hrown out of employment at the Kansas City Nut and Bolt works and Tillie Bullene lost her position at the Loose-Wiles Cracker and Candy factory. Elliot's picture is in the police rogues' gallery, and he was fined $25 for vagrancy about six months ago. He is 32 years old and has spent most of his life in Kansas City. Tillie Bullene met him about a year ago. Captain Whitsett has notified United States secret service men, Edward J. McHugh of St. Louis and J. A. Adams of Kansas City. John G. Ritter of 325 Park avenue, a driver for the United States Express Company, yesterday identified Tillie Bullene as the woman who, a few days ago, gave him a counterfeit dollar. He had whittled the coin in two, but brought half of it to Captain Whitsett. One woman was made happy in Kansas City yesterday. That woman was Mrs. Florence Scott, 1303 Wabash avenue, who for ten years has made a fruitless search for her daughter, Susie, given away in 1898. If all goes well she will in a few days see her daughter, now 17 years old, alive, well and happily married. W. W. Williams, a mining engineer of Salt Lake City, called to see Mrs. Scott yesterday. He said that he had seen in The Journal where Mrs. Scott was looking for her daughter, Susie, who had been given to Mr. and Mrs. R. L Martin, then supposed to be from Maryville, Mo. "As soon as I read the story," said Mr. Williams, "I figured out that your lost daughter was y wife. I married her in Denver fourteen months ago. She was the daughter of Mr. and Mrs. R. L . Martin." Mrs. Scott was beside herself with joy at the news. Williams told her that the Martins had given Susie a good education and had always been kind to her. He said his wife, who was 7 years old when given to the Martins, recalled her mother, often spoke of her, but could not recall her name. This, it is presumed, her foster parents kept from her. Williams also told Mrs. Scott that he had a good home in Salt Lake City and that he and his wife were happy. He is on his way to Chicago to attend to some business, but expects to return here soon. He wired his wife last night to come on here and meet him. He intends to surprise her by introducing her to her own mother. Williams told Mrs. Scott that he wanted her to get ready to go back and live with them. At present Mrs. Scott is working as nurse at the home of J. Baker, 1303 Wabash avenue. It was by mere chance that Williams saw the story of Mrs. Scott's search for her daughter. Sitting in his hotel yesterday he picked up a week-old paper which contained the story. The name of R. L. Martin attracted his eye and he read the story through. He at once came to the conclusion that Susie Martin had once been Susie Scott, so he sought the distressed mother and broke the news to her. Mrs. Scott called up Mrs. Lizzie Burns, police matron, who has been assisting her, and told her the good news, saying: "I guess the long search is over." Mrs. Scott says no adoption papers were ever made out for her child. CAME FROM AFAR TO WEDDING. A. J. Bergman and Miss Alice Goldasky, daughter of Mr. and Mrs. Soloman Goldasky, of Elmdale station, were married last night at the home of the bride's sister, Mrs. Bernard Millman, 220 East Fifth street. Rabbi Lieberman officiated. A brother of the bride, Morris Goldasky, a mining expert of South Africa, who had not been home in years, came in time to attend the ceremony. His homecoming was somewhat of a surprise, as he had expressed no intentions of doing so when he wrote to his sister last, and when he appeared on the scene of the wedding no one present suspected that he was any closer to Kansas City than Cape Town. Another brother, Herman Goldasky, of Denver, was also present. Mr. and Mrs. Bergman will be at home at 2113 Olive street after September 1. Charge of Victimizing R. A. Long. Oliver Smith, alias H. O. Lee, alias Benton Smith, alias O. B. Smith, alias S. H. Peabody, alias James T. Ridgeway, said to be one of the cleverst swindlers and forgers in the United States, was brought to Kansas City yesterday by Detective Thomas McAnany, after waiving extradition. Smith is wanted here to answer a sort of confidence game he is said to have worked upon many wealthy men all over the country. He represente dto Mr. Long that he was James T. Ridgeway, treasurer of the Ridgeway Publishing Company, publishers of Everybody's magazine. He contracted for an illustrated article, of which Mr. Long was to be the subject, to be printed in that periodical at an early date. In payment, Mr. Long gave him his check for $750 drawn on the National Bank of Commerce, which Smith indorsed as "James T. Ridgeway, Treasurer," and cashed through the Bankers' Trust Compay. Mr. Long later became suspicious fo the man and ordered the check cancelled, but not until Smith had obtained most of the money and gone to Denver. Smith is said to have worked this game upon scores of wealthy men all over the country. His plan seems to have been to represent himself as the agent for a large publication, to which he obtains subscriptions, asking amounts that varied as the means fo the intended victim were small or great. He is supposed to have carried a list with him containing the names of the prominent men of the city he intended to work, and from these to have culledo ut the prospects that bade fair to be the best "picking." When arrested in Denver he was occupying a suxurious suite of rooms at the largest hotel there. He made no resistance to arrest when the Denver detectives found him, but quietly admitted his identity and acknowledged the transaction with Mr. Long in Kansas City. He is said also to have acknowledged to the chief of the Denver police that he had planned to swindle some of the leading capitalists of that city. In his trunk were found memoranda of the men he intended to victimize, forged letters of introduction bearing the signature of W. H. Moore, head of the Rock Island railroad, and George F. Baker, an Eastern banker, and letters of indorsement purporting to be written by men like John D. Rockerfeller, J. Pierpont Morgan, Elihu Root, and others. The forgeries were clever and likely to deceive even those familiar with the handwriting of the originals. In his room at the Denver hotel were found eight different kinds of ink with which he is said to have forged countless names. It seems that the man's favorite game was to enter a city, select his victims, present his bogus credentials and attempt to secure subscriptions for magazine articles. Of adroit address, and armed with his forged letters of introduction, he was able to impose upon the cleverest businessmen, and relied largely upon their reluctance to tell the story to get him out of danger. In Denver he is said to have presented himself as representing the New York Herald Publishing Association, Syndicate of Fifty Representative Newspapers, Temple H. Hamilton, treasurer, and the "Men of the Time," from "Everybody's," S. H. Peabody, secretary. In Kansas City he passed as James T. Ridgeway, treasurer of the Ridgeway Publishing Company. It was under the last title that he obtained the check from R. A. Long. Among the past victims of the man are said to be Melville E. Stone, manager of the Associated Press, General Russell A. Alger, and Jesse Seligman, the New York banker. He is said to have served time in Sing Sing and the Minnesota and Ohio state penitentiaries for forgery. After his arrest in Denver he confessed his identity to Chief of Police Delaney and freely admitted that he was the notorious swindler and forger. In the Kansas City prison yesterday, however, he repudiated his interviews in the Denver papers and declared that he was not guilty of the gorgeries named. He admitted getting the money from Mr. Long, but claimed that he had made a bona fide contract and that he had signed his own name to the check given him in payment. Asked why he had given his name as Smith both here and at denver he said he was drunk and registered at the Savoy and Albany hotels in the two cities through a prank. He contradicted himself several times in his statements ot the newspaper reporters, however, and practically admitted everything he had been charged with. An interesting light was thrown upon his method of working by a memorandum list found among his possessions, containing names of leading capitalists of Denver and remarks upon the best means of getting at them. Names only of important business men were selected and these were labeled with a running fire of comment that indicated his thorough familiarity with the personal charactaristics of each. While in this city he was accompanied by a woman he says was his wife, who has disappeared since the news of his arrest in Denver. "Our agency is well acquainted with this man, whom we consider one of the cleverest criminals in the United States, said John A. Gustafson, assistant superintendent of the local Pinkerton office, "and our records are full of accounts of his misdeeds. He began his operations as an expert 'write-up man,' as we term the swindlers who use his peculiar method of operation, in New York in 1902. From there he went to Philadelphia in 1903, and pulled off one deal that netted him $10,000. From there he went to Cleveland, O., where he was caught uttering a forged check, and was given eight months in the county workhouse. In the fall of 1903 he was caught trying to work General Russel A. Alger on the write-up game in Detroit, Mich. After he got out of prison in Michigan he pulled off another little affair in New York, which got him a sentence in Sing Sing. He was liberated from there a few months ago, to turn up here in Kansas City at his old game." Senator Walsh -- Telephone him to his country place and then go out. Has a secretary who is a tough one. Senator Guggenheim -- Just elected United States senator. Will make a splurge. A. D. Parker -- Vice president Colorado & Southern. Is reputed to be worth $15,000,000, all made in mining. He has the distinciton of being the only man that grub staked a miner for twenty years, who after a number of years of hard luck finally won out. A great deal has been written about him in newspapers in this conneciton. J. J. Hentry -- Again on his feet promoting sugar beet factories. Likes publicity. E. J. Wilcox -- President of railroad and mining companies. Was at one time a minister and is probably worth $5,000,000. Is a good fellow and likes publicity. John F. Campion -- Mining man' probably stands the highest of any man in the mining game in Colorado. Worth about $5,000,000. Does not care particularly about publicity, but has had several steel plates and is known to subscribe to everything. Always winters at Los Angeles, where he is a heavy investor and associates with millionaires of the East. Thomas F. Daly -- Insurance president, good fellow; has made a million in a few years in insurance and mining. Otto Mears -- Railroad and mining. Well known character in Colorado. Has the title "Pathfinder of the San Juan." Dont think he has over $500,000. J. A. Thatcher -- President of bank; a good fellow and worth about $5,000,000.